Danny Fortune, cold war RCAF pilot, rode Canada’s cloudy skies from the Atlantic to the Pacific with side-trips to the North Pole from June 2, 1958 to December 6, 1958. He was the creation of two ex-RCAF pilots, Bob McCormick, artist, and Bill Dulmage, writer. 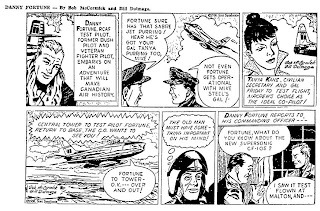 The strip began with Danny Fortune test-flying the Avro Arrow but a lack of interest by the comic strip reading public brought Danny Fortune to an abrupt and inconclusive end after a mere six month run.